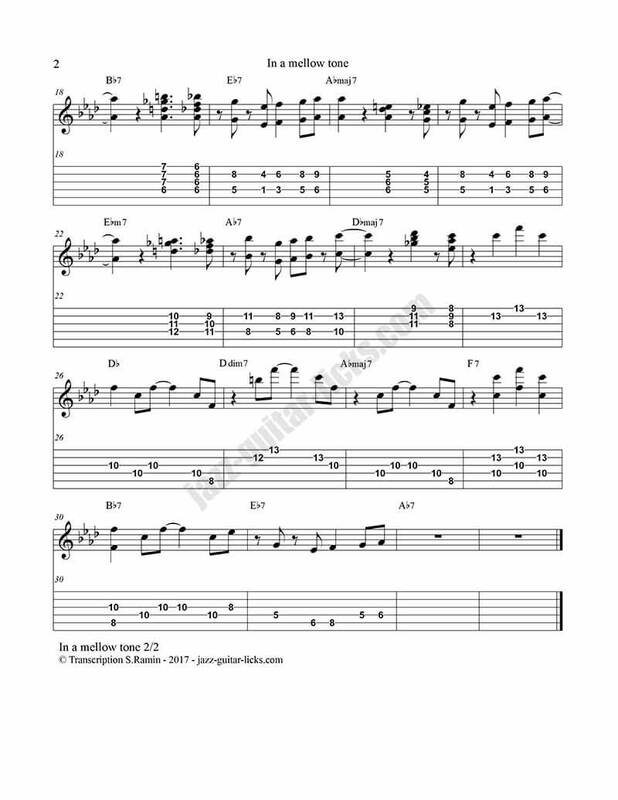 Here is a transcription with standard notation and guitar tabs of the theme of the jazz tune"in a mellow tone" by Kenny Burrell. 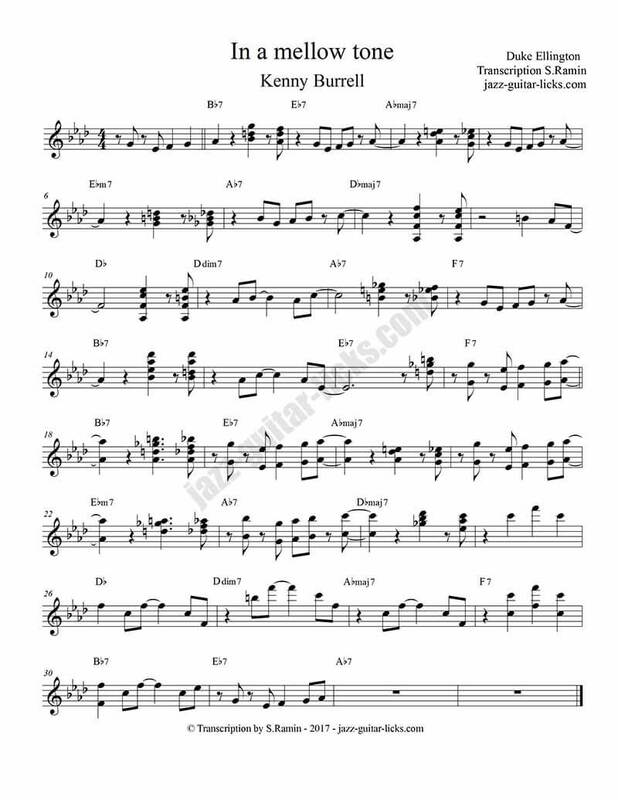 This jazz standard has been composed by Duke Ellington in 1939. You can hear Burrell's version in this video on which the transcription is based on the album dedicated to Duke Ellington. In a mellow tone has also been performed by a number of jazz artists as Ella Fitzgerald, Oscar Peterson, Joe Pass, Colman Hawkins, Tony Bennett, Count Basie. This is a great tune with some changes not be too difficult to be played by a jazz beginner. However, the chords used by Kenny Burrell requires patience, precision and a certain level of dexterity. 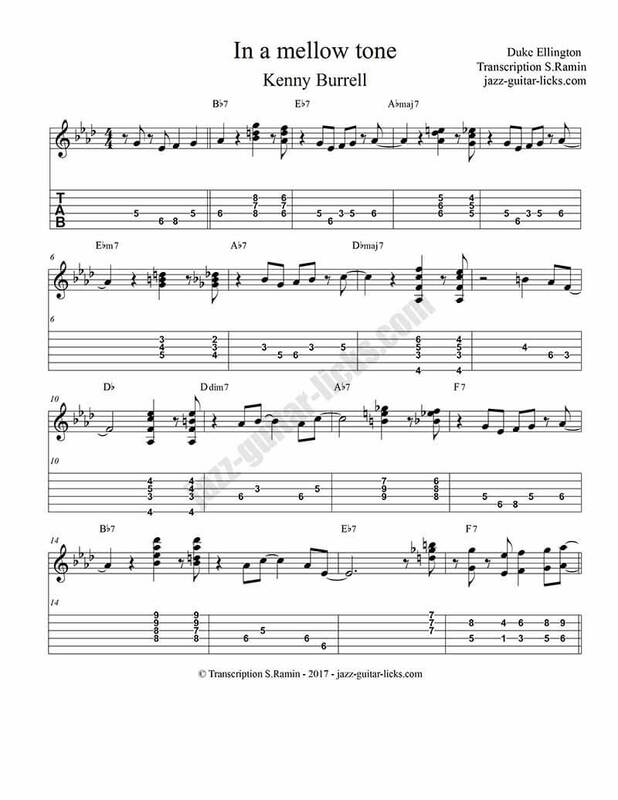 This transcription will help you understand how Kenny Burrell has approached the main chords, either by using chromaticisms (bars 3, 5, 11, 21) or voice leading (7, 9). You will have to use a technique called "octave-playing", indeed, the second part of the theme is played mostly by using octaves. Let's take a look at the chord progression. It's in the key of Bb with some interesting common changes as a II7 | V7 | Imaj7 on bars 1, 2, 3, 4 and a II | V | I on bars 5, 6, 7 and 8.